The latest satellite pictures shows a profound enhancement of the high clouds around this system (see above). The latest forecast models are even more threatening that last night...this is going to be a major coastal wind event, with damage and power outages. NW Washington will be hit harder than expected last night. And another issue...when the low is offshore, winds will accelerate to the west in the Strait of Juan de Fuca. The National Weather Service has now put storm warnings for the entire coast and the western Strait of Juan de Fuca. Here is the latest forecast for 5 PM tonight...pretty amazing. 989 mb low and a huge pressure gradient to its south and southeast. The simulation indicates even stronger winds than last night, with areas immediately offshore experiencing 60 kt sustained winds and hurricane-force gusts. 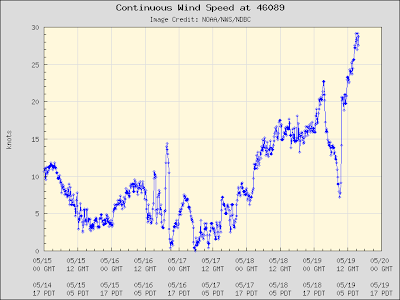 Unfortunately, most of the offshore weather buoys are broken (this is really a problem!) --that is why we need coastal weather radars! 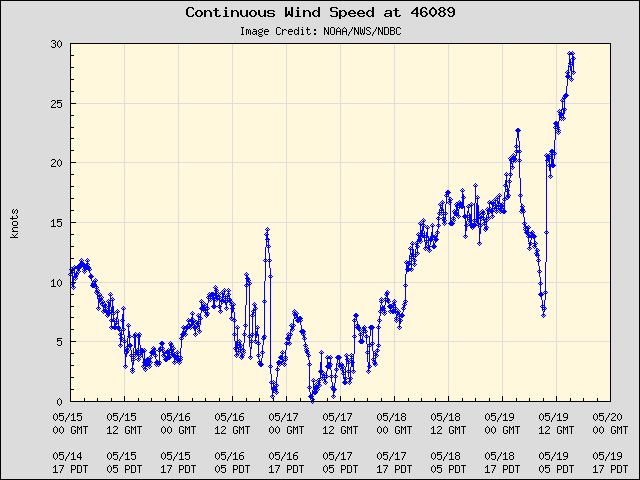 The best buoy (46089) we have now is about 90 miles west of Tillamook, Oregon and the winds there are speeding up fast (30 kts last hour).